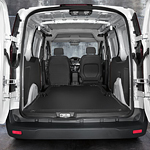 Regardless of the driving you do, the 2019 Ford Transit Connect could be the right passenger or cargo van for your needs. They are built with safety in mind, and Herb Chambers Ford of Westborough can show you all of the features that you can rely on to keep everyone in the van safe. Having adequate tire pressure in all four tires is important for maintaining control of your vehicle. The Ford Transit Connect comes equipped with a tire pressure monitoring system that will alert you if one of the tires is too low. The warning could let you address the issue before major damage occurs. To let you see in low-light conditions, the HID headlamps will turn on automatically when they sense darkness. They will also engage whenever you turn your windshield wipers on so that you can be seen in rainy conditions.